OK, so I'll admit that maybe "on fleek" is over, but it just felt right describing a celebration of melanin in the room at The Root 100 Gala Monday night. So let me have this, OK? At this point, you may have seen the epic (read: turnt) party photos showing some of the brightest thought leaders in the black community letting their hair down to "Knuck if You Buck," or maybe you've clicked on the hashtag #TheRoot100. Either way, just know that this annual gala celebrating black excellence in tech, education, sports, media, business, science, entertainment, activism and art is necessary. 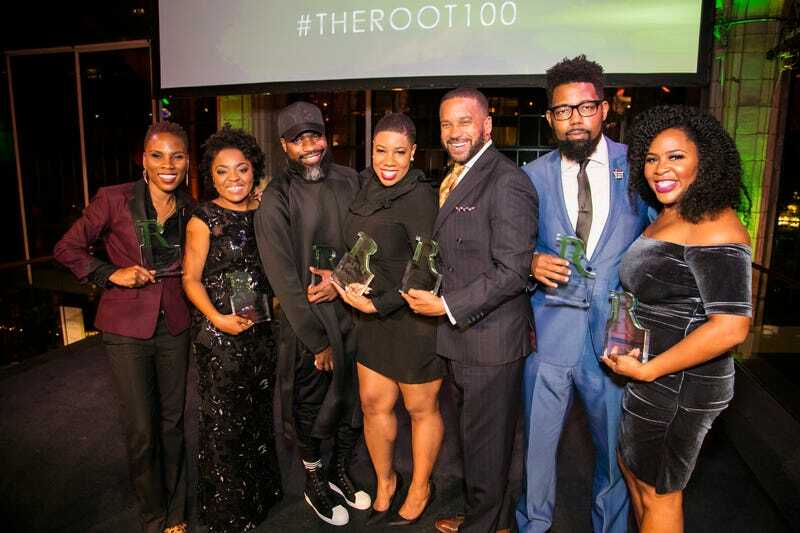 The Root 100 brings together not only powerful honorees but also their peers, in the name of awareness around their respective causes and letting loose all in one glorious night. This year's festivities were hosted by ESPN commentator and honoree Bomani Jones and featured other honorees like Luvvie Ajayi, Symone Sanders and Adam Foss as speakers. There was no mouth left un-yasssss-ed in the entire glamorous venue. In case you didn't get to join us, we're sorry—but we've got a nice consolation prize!